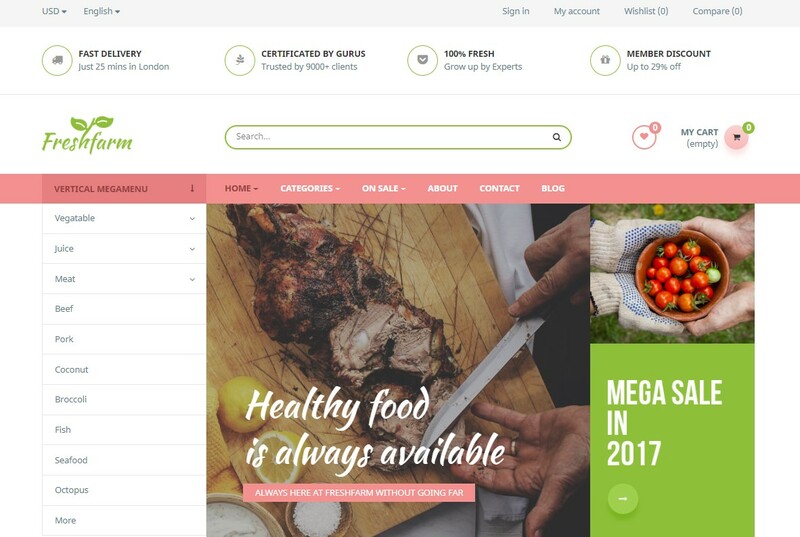 Are you looking for a best PrestaShop Theme for your Food & Restaurant Business to derive more traffics for your website? Thanks of time-saving & cost-saving, the customer can view your shop first for comparing the quality & service. Then they make purchase or go to your restaurant. 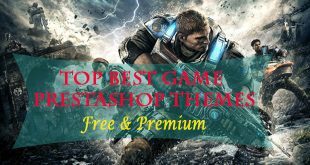 This collection Best PrestaShop Themes Restaurant – all necessary Templates for your Food Store, Restaurant, Coffee Lounge in 2019. They are Free & Premium PrestaShop Themes that allows to present your elegant website and get more traffics. If you are hunting for the Best PrestaShop Restaurant Theme for your website, follow us to discover list of collection of the best PrestaShop Themes Restaurant. 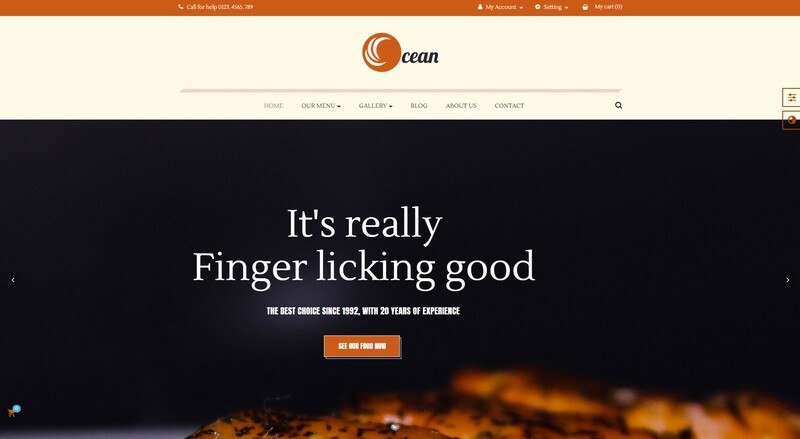 Leo Ocean – a neat, clean & fresh design for Restaurant PrestaShop Theme. The theme is developed with high restaurant performance in delicious & yummy food menu. It also have been optimized for lightweight, fast load & better conversion rate as well as device responsiveness & customers experience. Thanks to build on Leo Framework in PrestaShop Theme, Leo Ocean is ready to use for any store owners & customers. 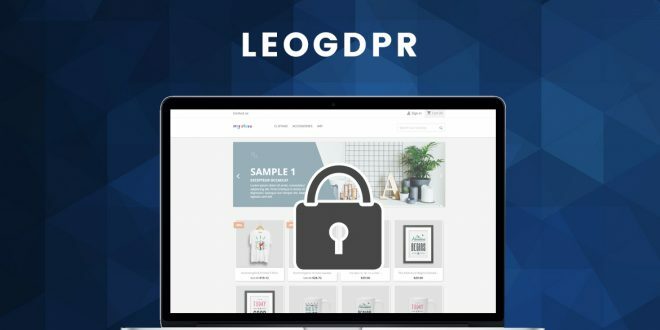 For store owners, they can experience on the theme builder & editor with helpful PrestaShop Module as Ap Page Builder, Leo Mega Menu, Leo Blog, … You are able to build & import full demos in 1 click installation import. 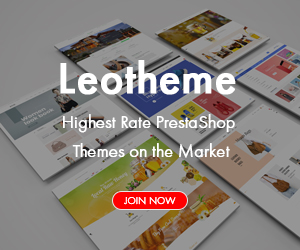 Quick installation & easy to use are the most advantages of Leo Theme PrestaShop Themes you can get. Interestingly, extensive SEO optimization & enhancements within Leo Ocean ensures a best Top Result on Engine Search performance to engage more traffics for website & accelerate sale sharply. Leo Juice is a beautiful and pretty attractive, polished and professional & easy to use, fully responsive PrestaShop Theme Restaurant, Juice Shop, Coffee Shop, Bakery & Pizza Website. 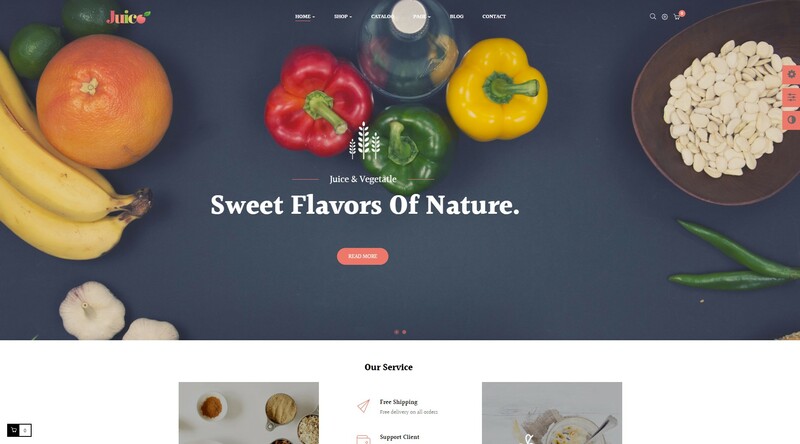 This theme has been developed by an skillful & dedicated experience developer & design team in PrestaShop for a fast website for Food Service industry & support effortlessly solution to create amazing website without the requirement for any line of code. With Leo Juice, you get a beautiful homepage design & a lot of Premium PrestaShop Modules which are already integrated in Leo Framework. Drag n Drop Page Builder, Horizontal & Vertical Menu, Eye-catchy Image Slider, powerful & flexible Live Theme Editor helps Leo Juice easy to use for all. Able to build a wealth of restaurant in mobile-friendly, devices & search engine. With incredible visual effects & design image, customers can be treated to a wonderful experience on each their shopping on the website. Better code, fast load & lightweight theme are the additional reasons why pick Leo Juice in your hands. Another template in this collection best PrestaShop Themes Restaurant is Leo Foodaholic. It is a cool looking Food & Restarant PrestaShop theme which is scaled fit any devices as Desktop, Mackbook, Tablet, Laptop or smart phone as well. The theme is presented greatly for Restaurant, Food, Pizza, Cafeteria, Bakery Shop or any dining website. Amazing drag n drop Ap Page Builder Module helps you create, edit & update content, layout & image easily. Specially, Leo Foodaholic allows to customize endlessly because limits are none. So the chance to make your website different from other becomes easier than ever. 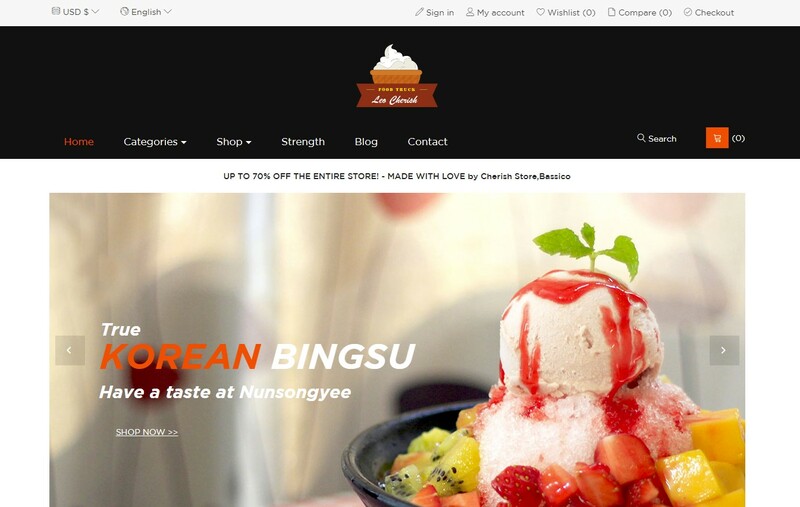 Leo Cherish is other Premium PrestaShop 1.7 Theme for Restaurant, Ice-Cream Shop or Cafeteria Shop. It’s an easy theme to configure food PrestaShop Theme. Detail documentation, updated & refund guarantee are available on Leo Cherish. Users can get all-in-one package theme & install website as the sample in minutes. No requiremention for web coding. Surely customers will be surprised to Leo Cherish & excited about food-beverage service, Restaurant that featured already in the PrestaShop Theme. Perfect SEO Optimization & RTL languages let customers search & find your website easily for their better order. 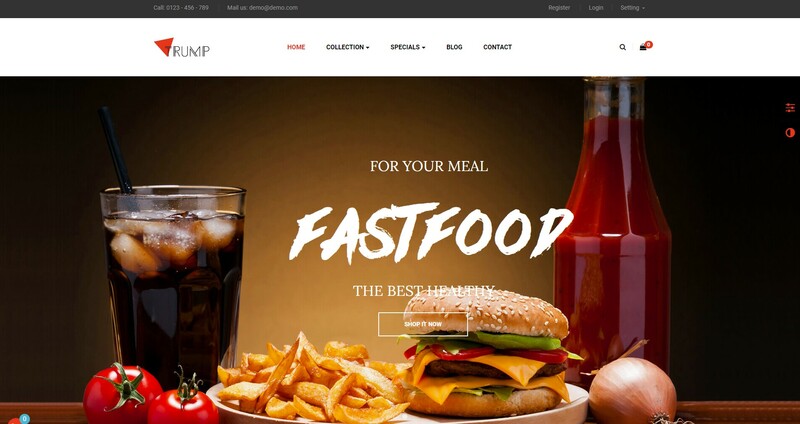 Leo Trump is one of the most popular Free PrestaShop Themes Restaurant. It’s FREE & offers delicious homepage for Food & Beverage, Pizza Shop or Restaurant. The easy-to-use Prestashop template let you build & change layouts & content easily. Moreover, live theme editor & fully customization supports to create different style for content & layout display to increase your brand identity & sale significantly. Leo Athena is a stunning, well-structured, professional & rapidly Responsive PrestaShop Theme Restaurant & Organic Shop. The theme has been created based on powerful Leo theme Framework for better customers experience & easy tool builder with all modern application & industries imaginable. To specify, Athena comes with powerful tool & read-optimization that suited with all customers from all walks of the life in a high-quality & professional website design. With just 1 click installation demo, your setup can be done in minutes in order to save tons of time & money. 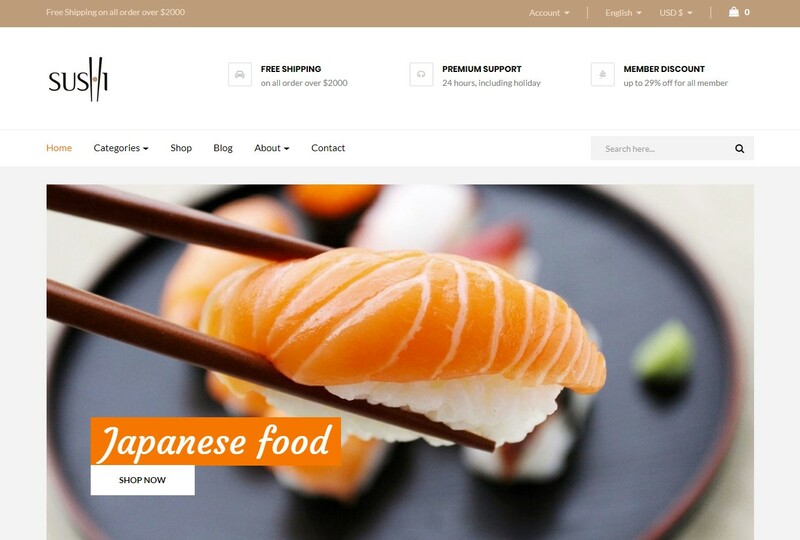 Leo Isushi is great PrestaShop Theme for Japanese Restaurant, Food Shop. Without any code requirement, Leo Isushi is featured with fully customization, better navigation, rich features for restaurant website building. Your website can be impressed with all audiences at their first website visiting. Other PrestaShop Thems 1.7 for Restaurant I mentioned in list is Leo Cabbage. Fresh layout, attractive product images & rich content of Leo Cabbage that presents perfectly your freshness, high-quality & organic products. Keep the visitor’s attention at the first sight on premium sliders and focus on where you want. Customizing for branding, code-free & SEO optimization helps your website more popular with others. By virtue of the support of Page Builder, it ‘s easy to create content, layout in a visual & intuitive layouts. 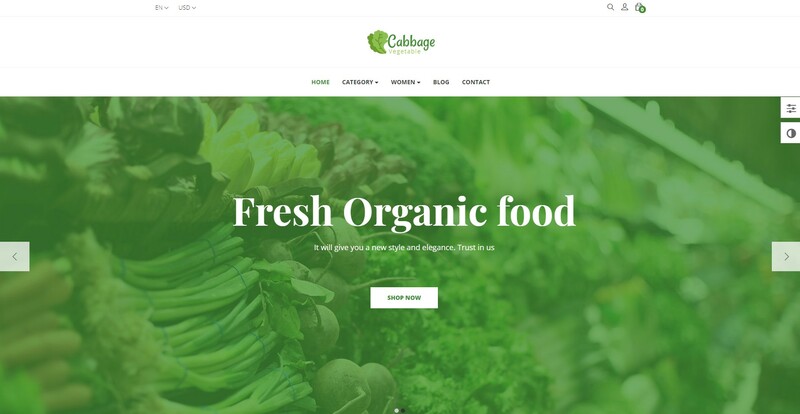 So leo cabbage is not only a beautiful PrestaShop Theme Restaurant but also a better PrestaShop Theme for SEO & builder. Don’t be hesitated. Get theme now! Currently, if you are seeking a best solution for a food & restaurant website, you don’t need to hire developer to build your site. Because, the easy-to-use & builder theme is here. 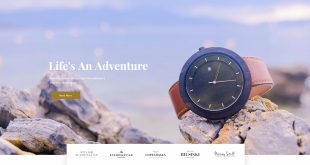 With Leo Koreni – Spicy & Condiment PrestaShop Theme, you can import all demo samples ( homepages, style & CMS page) promptly. 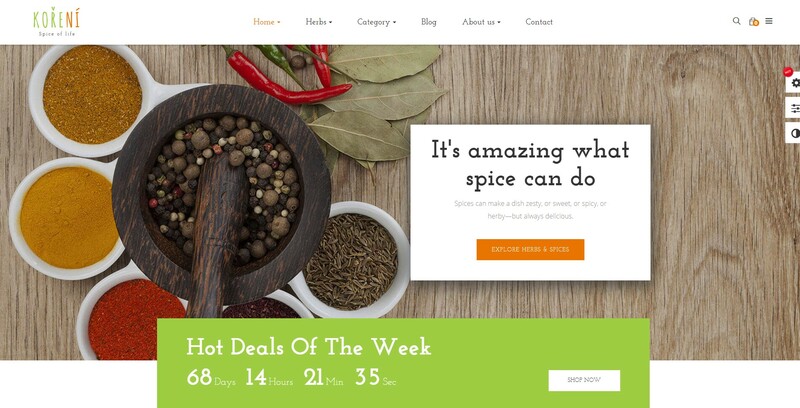 Moreover, the fastest PrestaShop Theme restaurant offers a smart website builder. Able to build content, layout & menu. Let them experience your world of food and delicacies with a full-screen video background on your site load. Grab their attention and make their mouth water once they start browsing your page and checking out all the visual content you have in store for them. All this, you can accomplish with Kalium’s fully functional restaurant demo. It also comes with a categorized menu, stunning gallery, blog and reservation form with time and date pickers. In addition, Google Maps is also integrated into the web design so they will find your location quicker. Leo Fresh Farm brings you a friendly and modern web interface by the best Prestashop Framework it is built on and its powerful modules, namely Leo Slideshow, Leo Megamenu, Leo Feature, Leo Blog, and Ap Pagebuilder module, which are always updated with the newest module features. It is to say that, these features provides user with useful handy tools to build, manage the site effectively. 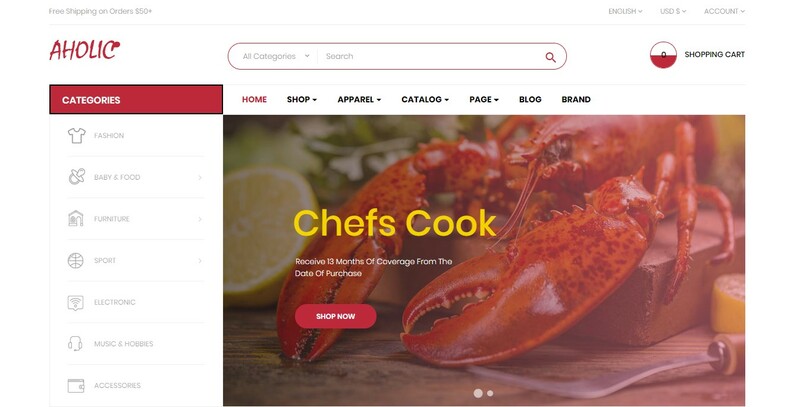 Here are all 10+ Best PrestaShop Themes Restaurant & Food Shop in 2019. Hope that this collection will help your website builder easily & conveniently. 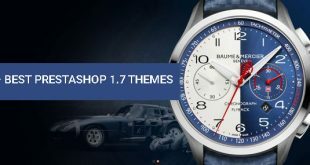 In a notable way, these beautiful PrestaShop Themes are in PrestaShop Membership at Leotheme.com. You can join in PrestaShop Membership with just $99 to get 300+ PrestaShop Themes for any Ecommerce.